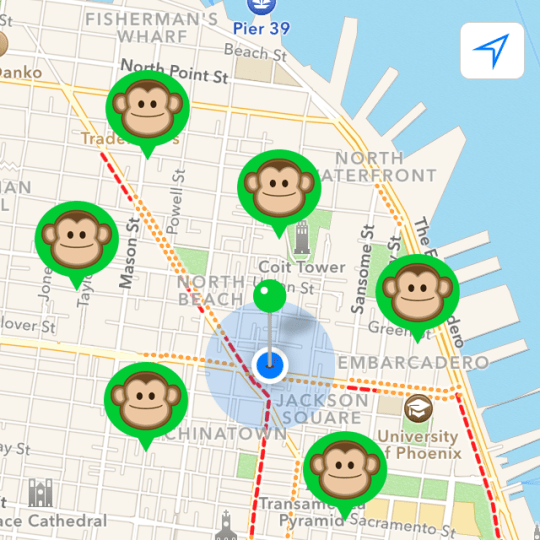 A new app called “MonkeyParking” being tested in San Francisco has made the rounds in local media this week for its bizarre driver-to-driver payment system. Here’s how it works: A driver leaves her car in a valuable parking spot and tells other app-using drivers that she is willing to move it for a price of up to $20. Whether the app will have any effect or even pass muster with the law is almost beside the point. “MonkeyParking” is a great illustration of how free or underpriced curb parking in SF is completely absurd. If the city isn’t willing to put a rational price on a limited resource in high demand, profiteering drivers can and will step in to take advantage. Talk about the high cost of free parking. It’s no wonder drivers are willing to create their own ad hoc market to allocate the limited supply of curb parking. As Streetsblog has written extensively, underpriced parking is bad for everyone, including the drivers who end up wasting time and fuel circling around for a spot because none are available. “MonkeyParking” isn’t a fix for the problem — it’s a way for people of means to try and circumvent it or cash in on it. One man predicted to KCBS, “You’ll end up with space squatters.” Unlike a city program like SFpark, “MonkeyParking” doesn’t create systemic change because it doesn’t affect a large enough chunk of the parking supply. And none of the revenue goes to the city to improve transportation options. Others have found different ways to make money off San Francisco’s free on-street parking, including a van owner who rented out his vehicle on AirBnB, effectively turning it into a subsidized hotel. The app, though, is actually a rational response to the weird and irrational world of parking policy, where Mayor Ed Lee pushes the SFMTA Board to repeal Sunday parking meters, and then people complain about how they can’t find a spot. There are many bad things to say about this, so I will not pile on. However, there is one relatively nice property about this idea. It allows people to choose whether they want to pay with time (low-income) or with cash (rich). In fact, some (market-makers, a.k.a. sharks) will be trading their own time for someone else’s cash. The more sharks, the lower the price, so there will be a natural limit to how many sharks are willing to trade their time for cash. Thus there will always be some chance for some to park without paying. Parking meters do not allow that trade-off. This is one of the main (albeit not very good) arguments against parking meters: that they somehow penalize the poor and help the rich, since the poor can afford to pay with their time, and the rich can afford any price, thus the rich win, since the system doesn’t allow paying with time. Off course paying with your time in this case has negative externalities to those around you – circling around to find a spot, causing pollution, so it’s unclear if it’s a desired outcome anyway. The system is so absurd, it deserves to be gamed. Kudos to MonkeyParking! I have a new business venture idea–the faux car, parking spot holder. When you leave your parking space, you take the lightweight, cleverly folded origami package out of your trunk, push a button, and it unfolds/unsprings itself. Voila, you have a car to occupy your parking space while you’re gone! It is cleverly designed to be lifelike enough to fool the casual observer, and you can tether it with a chain to a street cleaning sign to prevent theft. When you get back, press another button, fold it back up, and the parking space is yours again. Goodness, there are lots of possible business opportunities making use of free/cheap, high demand San Francisco parking. I’m almost ready for my IPO. It’s the prefect compliment to free sunday parking. Just park in a busy neighborhood center and wait until you get offered $20. Whatever happens, Gabriel Zitrin has my admiration for delivering the quote: “So far, all we’ve determined for sure is that it’s extremely weird.” SF government needs more of a sense of humor, and acknowledgement of how odd things can get! Breaking: government-mandated price controls create shortages, black-market develops. Breaking: narcissistic right-wing ministers demand that city revoke plan to increase parking availability on Sundays, black-market develops. Of course, the rich have always had more options: valet parking, paying for reserved parking in a garage, constructing a garage under their house. That’s the way it goes. The rich/poor dynamic is a major reason why the revenues from meters are often dedicated to public transit. This time/money tradeoff affects the situation in other ways, too. For instance, you “pay” the same amount of time each time you park regardless of how long you park for, whether it’s 15 minutes or three days. As a result, it subsidizes people who leave their cars for long periods at the expense of those who just want to pop in to a store. It also depends on the time of day, so people who arrive at at 4:00 may be charged much less than those who arrive at 6:00. These “sharks” may be “buying” the parking at 4:00 (when it’s cheap) and selling at 6:00 (when it’s expensive).